3D printers generally print using ABS plastic, which is great for most applications--I mean, they make Legos out of it, after all. 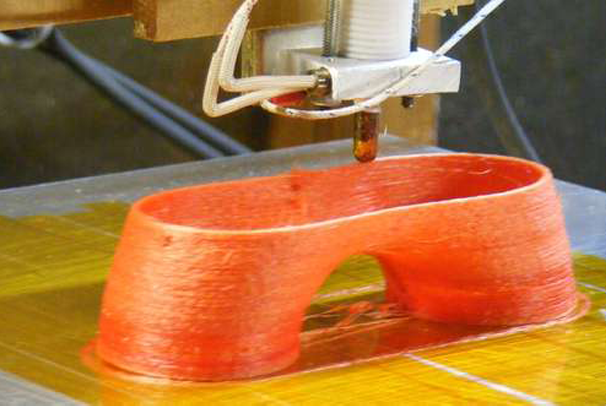 When printing thin pieces, however, ABS can be quite brittle, and it tends to snap when put under stress. Instructables user taulman got the idea to use nylon in place of ABS: Nylon shares a lot of the same properties of ABS, like the ability to extrude it (albeit at higher temperatures), but it has several advantages. First off, nylon has a greater degree of flexibility than ABS, so it won't snap as readily. Not only that, but the naturally low levels of friction between nylon means any gears you print won’t need any lubrication. As we mentioned, nylon does have to be extruded at a higher temperature than ABS--around 320 degrease Celsius for the Nylon that taulman uses in his designs. This can cause the printer to draw more power, it can increase the cost for parts, and it has the potential to seriously burn you. If built and operated properly, though the nylon printer can make some very versatile parts, including a decent shock-absorbing case for your phone. This brings to light the possibility of using other materials with higher extrusion temperatures and different characteristics such as rigidity and durability. Check out the video for some examples of stuff printed in nylon.